Happy to help with anything you need, brutha. Love the new blog, Mr. Singer. Check in with The ‘Burgh Blues when you have a chance. Hey, welcome to MLBlogs! As for Howard, I really do think they should consider K’s. Anytime a player does NOT make contact with the ball, NOTHING good can happen. At least if they hit it, there is a chance. Now calculate the % of chances Howard blows by whiffing, especially when compared to other players on the team, and that should translate monetarily in some form. And certainly when deciding on such hefty salaries, it should have meaning. Now, I love Ryan Howard and fully understand the value of 48 home runs, but like I said, with all the lack of contact, I think 18 million is really pushing it. Welcome to MLBLogs! We won’t hold it against you that Mark recommended you! (Only kidding Mark!) I think there are some players (Like Jason Varitek!!) who are now wishing they had taken arbitration! Welcome to MLBlogs! Mark recommended that we check you out, and I’m glad that he did. There are so many pros and cons to the whole arbitration process but trying to make some of your star players look terrible IS terrible. But then again, some of the players think they need to be paid much higher than they actually deserve. Seeing Jeff Kent’s retirement speech on ‘MLB Network’ made me tear up a little bit. He seemed like such a nice guy, and I think he’ll go to the HOF. It’s funny that I read your blog. 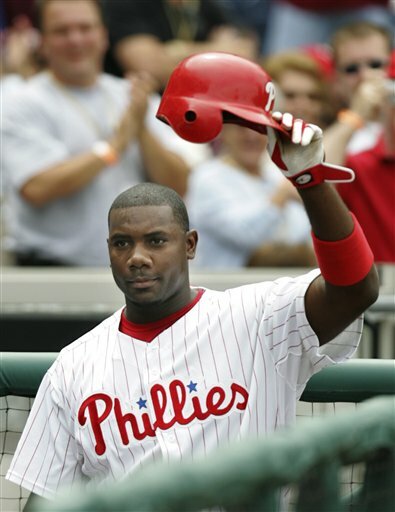 I actually just posted one about Ryan Howard and arbitration. You should check it out! Liked your blog! Burgh Blues is cool (though I loved the sleeveless jerseys; they had that retro ’60s look). Elizabeth, so much for “there is no crying in baseball,” huh? I guess there are plenty of tears AFTER baseball. Welcome to the MLBlog community. I look forward to more… I also look forward to dreaming about making Ryan Howard-like money someday — “Dreaming” being the operative word, of course. See, I wasn’t a fan of the sleeveless look, Tom. I mean, they were going out there every game wearing… vests! Good luck with the blog, and remember to check in with TBB.